I Saw the New Heaven and New Earth! God's Protections and His Plans! "God's Protections and His Plans!" The Lord has shown me to start this article by talking about His protections, although it includes a picture of a great destruction. The Lord loves His people and always makes a way out for them; it is a surety. The problem is that sometimes we miss the protection that is available because of our own doctrines and personal ideas of faith, not knowing the ways and plans of the Lord. The protection God is revealing in this article is not in the protection section of Demonstration of God's Covenant - What We Are to Walk in Today animated movie. However, this type of protection is quite common with the Lord and seen in the Bible over and over. We must understand that God had a plan and protections for the righteous when He flooded the earth, as well as when He told Joseph to take Mary to Egypt for protection (Matthew 2:13). God had a plan and protection for Israel when He sent the death angel to the first born of the Egyptians. The key to these types of protections is always obedience to what God reveals as His plan. I received by e-mail the prophecy entitled The Burden of the Great City - A Coming Woe of Destruction that came through Nathan Leal. While reading it I was impressed to go to The Hill God Calls the Place site and read (and hear) a prophecy through A.C. Valdees given in 1929. Later, the Lord informed me that I was to bring the two words together and put them up in cyberspace. The two Words overlaid each other perfectly and I knew the Lord was bringing "things of the Spirit" together, line on line, for our further understanding. The Lord even spoke to the group here about the revelation that was coming forth at this time! I was saddened because I knew when the Lord brings things together in our flow chart this way, the total message is always accurate, but I was unaware that I didn't have the bigger picture of what the Lord was doing. In the scene I saw a hole and a post was placed in it. That post had designs on it, was permanent, and it represented Protections of God. I was told to start with it. I then saw something being slowly written, moving down with some designs and pictures mixed in. When the writing was finished I saw two lines, like the lines forming the outer wall of building plans come out of the post. They moved out and down encircling the writing. It was like a border of protections came out of the pole. Because of some other "things of the Spirit" I finally realized that the building plan border meant that the Lord was telling us to thrust the Hill God Calls the Place into view in this writing. So now you see why I started this writing by talking about God's protections always being there and why it contains the subjects it does. It is all encapsulated in God's revealed plan for His righteous people during a time of coming crises. A fearsome woe is upon the land! His hand of judgment moves over the waters. The cup is full of mixture, mired with the deeds of man. Behold, the cup is poured out! There is more to consider. For in that day, before the eyes of the people, there shall be grief and sorrow. The carcasses of many shall be strewn upon the sands of polluted waters. The hearts of many will fail in disbelief. Their eyes shall behold a horror! They will be stricken with sadness. They shall be in want of a better day. Death will strike down the heart of the proud. Prepare for a great woe. A mighty wind will descend from the sky. The clouds will dissolve before their eyes. Anguish shall be upon the land. It shall be with strength and fervor. And none shall be at rest. A burden shall arrive at the great city; a shaking will rock the ground. The ferries and the ships shall reel to and fro. There will be shipwreck. The cargo will release and be lost. Burning clouds shall cover the face of the land. They shall gasp as they behold the darkness; overshadowed with blackened smoke. The dead shall be sifted from the living. The breadth of destruction shall be mighty and wide. The great city shall melt like burning pitch and give birth to many fires. A banner will proclaim this tale. A banner lifted high with no celebration or comfort. A banner shall replace their wants with soulful mourning. A banner without a victory: a banner proclaiming defeat! The city shall be poisoned! Woe to this city, for great pain has arrived! Who will watch and who will be among the fallen? The great nation will fall to the ground. There shall be a great spoil. The eve of destruction has passed. Her appointment is at hand. Only a remnant shall endure. Only those that seek His face shall find comfort and mercy. As you can see, the prophetic words above illustrate that an event of catastrophic proportions is approaching. I believe that this event will occur in America. I do not know if this will be a terrorist attack or through war. I also do not know if it will be caused by something else like natural forces or an accident! According to this warning, there are going to be mass casualties. This means many people will die when it occurs! I also believe that when this event happens, it is going to change everything! Life as we know will be a thing of the past. The powers that be are hoping for a New World Order. A catastrophe of this magnitude would be used as their “Pearl Harbor” event to bring their New World Order into fruition. This explains the words that say: The conquest approaches! Indeed my friends, the conquest of America is approaching! Please take this warning to prayer and get your house in order. Please share this warning with others. The Lord said, "Bring them together." It was an awesome vision. He was up in Vancouver BC when he saw the vision. He lived in L.A. and the streets of L.A. were clear roads. The buildings were red brick buildings; keep that in mind. In the vision, to the best that A.C. Valdees could ascertain, the streets of the city were kind of like Berkley, CA. In this city the buildings glistened like glass. The hi-ways were like ribbons, interweaving among themselves. The cars were egg shaped, they looked like eggs. He said, all of a sudden, in this big city, went off an air raid siren. People ran out of their houses, jumped into their cars and headed onto the freeways, jamming the freeways. They were running out of their cars, looking back at the coast, it was like they feared what was going to come up out of the water. They kept looking back, trampling one another, trying to get out of the city. When all of a sudden up out of the waters came this cylindrical object and steam. And it leveled off, heading right over the city, coming at a very low altitude. He saw on the side of it there was fire coming out of its tail. And he said he saw letters on the side of it. Now this was in 1929. 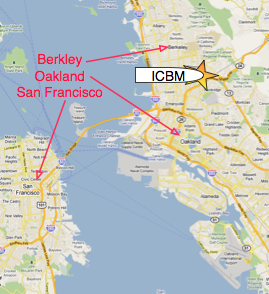 It said, ICBM. All of a sudden it went off. This thing exploded. He saw a massive mushroom cloud that exploded in the atmosphere and the city disappeared before his eyes. He said all of a sudden the angel that was with him said, "We’ve got to go down into the city." They went down into this massive area of a crater of devastation. He said as we were walking up out of the crater the ground below his feet was like sand dunes. He said he kept looking at it because it was sparkling, yet it was black. He ran his fingers through it and saw that it was pulverized steel, concrete and glass. As they were going further out of the city there began to be windrows of bodies, people and debris mixed together. Farther on out people were standing, walking around crying, and their eyes were literally melted out of their sockets. It was a horrible scene and in the midst of it he cried out, “Oh, GOD, would you destroy the righteous with the wicked?” He said a voice spoke from above and said, “Take him to MY abode.” Something like that. While the Lord was dealing with me about this article I experienced a scene where I was playing the Star Spangled Banner perfectly on my trumpet. It didn't matter which valves I pushed, I was playing it clearly and precisely with my lips. This is the same trumpet the Lord showed me using when I was sounding the alarm about 48% of believers missing in Heaven! It says something towards sounding the alarm concerning the USA, doesn't it? There is no doubt that God's judgement is coming to the USA. The picture presented by bringing these two words together will come to pass. The Lord said, "The conquest approaches." There were a few who attacked me for putting up the vision of the White Horse of Revelation carrying the American Flag in the war room of heaven. They went on about how bad the USA is, suggesting the vision was not from God. They didn't understand the ways of the Lord. Years ago there was a Word that came forth where God revealed that George Bush was His man for the office. Some were upset at this also, but we must understand that God uses countries to execute His plans. God was simply revealing that He was using the USA in war to set the stage for end time events. (See the White Horse movie.) In the Bible it was not uncommon for God to use a nation against another nation and then deal with the nation He used. This has always existed, but the point is when it becomes the ruling factor in a nation, when it becomes legislated, God will eventually deal with it. When God told me we are judged as a person, as a family, and as a nation, it opened my eyes to a broader picture of God's ways. I realized that a righteous person will go through the judgement of a nation. This article is dealing with how a person does that! In the picture presented by the prophecy and vision coming together God says, "The great nation will fall to the ground." One city being destroyed on the west coast would not make the USA fall. There will be more calamities and things happening to cause that. Years ago I was traveling across the country to a meeting in New York when out my car window to the north I saw a huge mushroom cloud come up from the ground on the horizon. God didn't say anything about that vision at the time and hasn't since. I can only tell you it was north towards Chicago and it will happen some time in the future. Logically around the same time of the destruction revealed by bringing the two words together in this writing, but only God knows. The thing is, are you willing to yield your life to God as He said in the prophetic word, The Spotless Church! and let Him tell you where to go for safety, like He did with Joseph and Mary? He will tell you where to go, as He knows all of the places of destruction that will occur. Remember He said, "I care for MY own." He always provides a way! Historians say that the life of any nation is about 200 years, but this goes on beyond that. It is God dealing with a world of humanity who is ignoring Him. It's about end times and the revealing of Jesus Christ. I gave witness to a great destruction in the earth on this site. I was told not to write the vision, that people would know it was what I saw when it occurs. God would not have you ignorant, so He is revealing some of His plan now. Looking at the picture given by the Holy Spirit of this writing, I am to finish it by talking about the Lord's plans, including protections for His people. At the end of the A.C. Valdees vision we see that God was starting to reveal His plans for His Beloved in 1929. "MY Beloved" is His Spotless Bride and A.C. Valdees said the people were clothed in white. You wouldn't say that if their clothes had spots on them. AC Valdees was emphatic that this was not the rapture, that the people had their feet on the ground. The Python spirit is working hard giving visions and even distorting God-given visions concerning the catching away, even now. Anything to confuse the people by distorting the timing in the plans of God. Grapeland TX, The Place GOD Calls the Hill is a mount of sanctification, a mount of cleansing and healing ordained by GOD. GOD is at work today, just as HE was yesterday, and just as HE will be tomorrow. Then later on 7-11-2010, the Lord told us to thrust the Hill forth, "Bring it forth," leading us to doing this writing. God said years ago that the purpose of the Hill was to bring forth the Spotless Bride in the earth, that it would be done over time. It's already at work because God gave a picture years ago showing Take His Heart to the World ministries is in God's building, which also contains the physical "The Hill God Calls the Place." Both are God's building, His doing. The symbolic picture given by the Lord on April 24, 2007 revealed they are connected to each other through protections. We understand now that God brought forth Take His Heart to reveal the necessary sanctification,... cleansing... ordained by GOD for a person to be in the Lord's "Beloved" whom He will protect. God has presented a clear picture in this article that the "Beloved of Christ" already exists on earth before The Burden of the Great City - A Coming Woe of Destruction occurs. God says in that Word to,"Prepare for a great woe." Looking at the two words together we see that the only people who were really prepared are the Lord's "Beloved."